Soft Tissue Issues – The Foot Guy | David Allison, D. Ch. Foot problems arise due to changes to the skin. Whether it’s a build up of too much skin, abnormal soft tissue bumps/lumps, or the breakdown of skin, such as a foot ulcer, David Allison is here to help. We can help you with all your foot care problems. Click any heading below to learn more. Calluses are hard, thickened areas of skin. These layers of thick, dead skin can cause foot pain if they develop on weight bearing areas, such as under the ball of the foot or on the heel. Excessive callus formation can lead to the breakdown of tissue underneath the hard skin, which can lead to a serious infection. Corns are dead, thick skin that form when the pressure point against the skin has a circular motion. This creates an upside down cone of hard skin which can cause pain or serious discomfort. Definition: inflammation of the plantar fascia at the bottom of the foot; sometimes associated directly with plantar fasciitis. Do you ever suffer from sore, painful heels after long periods of standing or walking? Are you experiencing heel pain upon standing first thing in the morning? Is the back of your heel sore or painful? If so, you are experiencing one of the many symptoms of heel pain. A plantar wart is a lesion on the sole of the foot that can cause pain, especial when they are found on the ball of the foot or the heel. 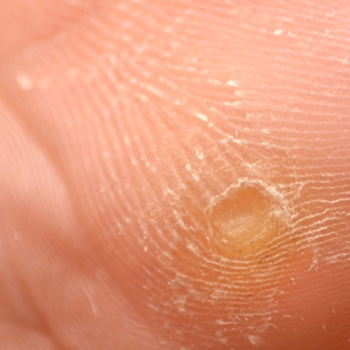 Warts are caused by a virus, human papilloma virus (HPV), and appear as a soft central core that is surrounded by thick hardened skin resembling a callus. Multiple tiny black spots can sometimes be seen on the wart as this is the wart’s blood supply. Definition of an Ulcer: an open sore on an external or internal surface of the body, caused by a break in the skin or mucous membrane that fails to heal. Definition of Wound Care: steps taken to ensure that a wound such as a foot ulcer heals correctly. Ulcers are caused by the breakdown of skin leaving an open sore. The most common types of ulcers are venous ulcer, arterial ulcer and neuropathic ulcer. Wound care is necessary to ensure the open sore closes and heals properly.